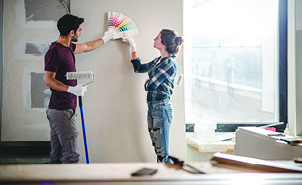 When you need to finance large expenses and projects, the key could be your home's equity. Our loan and line of credit options provide flexibility. Make your home work for you. Choose between fixed and variable rates, depending on your plans and budget. Either way, we make the application process quick and easy. Flexible option that allows you to access money anytime for up to 10 years and repay it over 15. *Annual Percentage Rate. Rates may be higher based on term and credit score. Variable rate loans are tied to market index (or prime rate). Rates and payments may change over time.